Much of industry has lost its way in this more complex and volatile world. Read this book and you will discover when and how the way was lost. Furthermore, you will find a different way to think, design, operate, and measure a system in a more complex and volatile world; a way that is both simpler and smarter. Metrics tell us how we are doing based on what we want to achieve. Yet it seems most companies struggle to define what they really want to achieve. In the for-profit world it should be relatively simple—the maximization of shareholder equity. The insidious problem referred to above is the route most organizations assume is the way to get there a route that is totally and unequivocally wrong. The fact that most industries believe that way is right does not make it any less wrong. Proving the bold statement made above is the journey this book is designed to take the reader on. We believe the book is written in a prereq- uisite order necessary to fully comprehend the definition and use of what we call smart metrics . This book really has three sections. The first section, comprised of Chapters 1 through 4, is designed to first state the problem and then set a framework for managing an organization in the much more complex and volatile world of today. This framework, called the smarter way, is comprised of three sequential components. The first component (Chapter 2) addresses how the organization needs to think from a systems perspective. The second component (Chapter 3) describes how manufac- turing and supply chain entities must design their operational systems to deal with a more complex and volatile world using the new demand driven operational concepts. 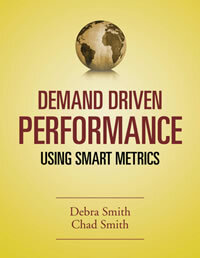 The third component (Chapter 4) introduces smart metrics, to sustain and improve these new demand driven systems.